Thank you. Please check your email for our latest whitepaper and material. TAP network -- the first Decentralized Advertising Network that rewards consumers for everyday purchases in the “EXPERIENCE ECONOMY” and connects approved brands to millions of consumers 1-on-1, powered by actionable data permissioned and encrypted with blockchain technology. Consumers can download any of the network apps, with TAP Wallet built-in -- no need to understand blockchain or crypto. Spend as you normally would on your credit card. Connect your CC with HOOCH to verify if purchases are made with any of the 100,000+ partners within the HOOCH ecosystem. Earn 5-10% of your spend back in TAP Coin with 100,000+ HOOCH partners. Say goodbye to the days of CPM-based advertising with minimal traction. TAP blockchain-based advertising programs allow brands to identify and reward target consumers based on their purchase history (and a variety of other demographic categories). Today's “spray and pray” advertising is incredibly inefficient. Brand advertisers are HOPING for 1 in 1,000 response. Using Blockchain, brands can have millions of direct micro-campaigns via smart contracts with consumers 1-on-1. 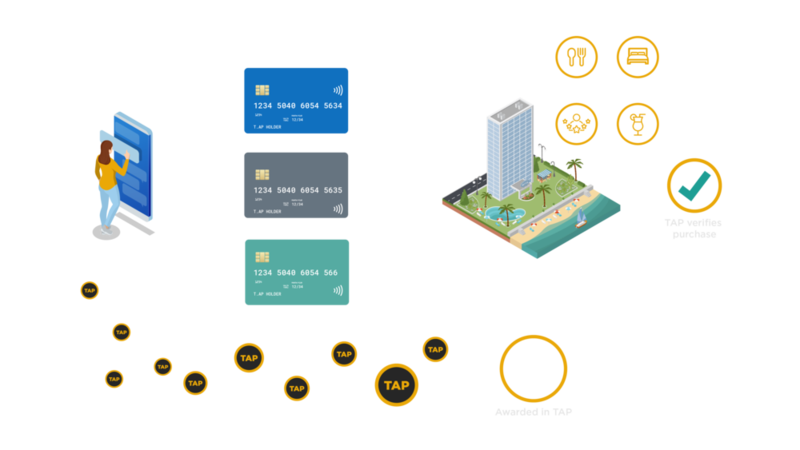 TAP allows consumers to directly control and monetize their purchase data for the first time. Consumers store their brand permissions in smart contracts, and get “paid” in TAP COIN when brands promote to them based on their data.